Added Comfort for the Sportsman Who Also Entertains. With its solid, hand-laminated dual-hull construction, the Twin Vee 260 SE PowerCat delivers stability and wave handling that outperforms larger watercraft, especially on open seas. Twin Vee’s unique foam-filled, self-bailing power catamaran design is safe, versatile and easy to operate. Better still, you no longer have to choose between size and affordability. The 260 SE PowerCat, with its wide beam, has ample deck space for serious angling or for the whole family to enjoy all day on the water, yet it is affordably priced and cost-efficient to run. We have packed the 260 SE PowerCat with new standard features but kept its industry-busting low price. The bow and stern now have built-in molded fiberglass storage and seating, beautifully upholstered with top-quality marine cushions. Matching custom-designed Llebroc adjustable chairs have also been added at the helm. 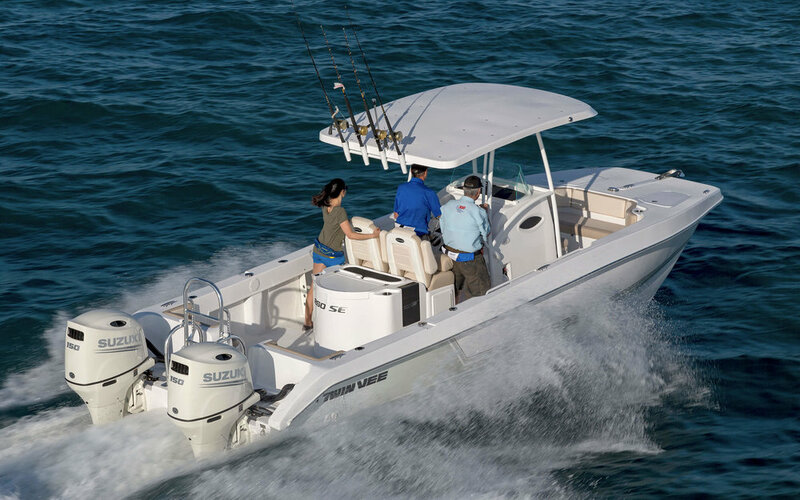 Under the 260 SE PowerCat’s all-new anodized high-grade aluminum hardtop T-top, the console features a Ritchie Voyager compass, a new electronics panel with USB and 6-volt charging ports. The redesigned fishing station incorporates a 50-gallon live bait well with a prep area featuring built-in quick-access tool storage and tackle drawers, inset cutting-board and freshwater washdown. Additional standard features include a dive ladder and under-gunnel rod holders. The 260 SE PowerCat is delivered ready to run. Further customization is a breeze with an easy-access hatch to console electronics and pre-installed rigging tubes for extra batteries and wiring of additional electronics, including a bow transducer mounting area.